Elephant ivory is on the march. Not elephants, but their ivory. The elephants are left bloodied and dead on the range. So are many rangers who work to protect a country’s natural capital. In the past 10 years, over 1,000 rangers have been murdered in 35 countries alone; the International Ranger Federation tell us that as many as 5,000 may have been murdered worldwide in that time. At the CITES COP – the Conference of the Parties to the Convention on International Trade in Endangered Species – the halls in Bangkok ring loud with concern for the elephants and other charismatic species, particularly rhinos, that are being exterminated across Africa in pursuit of private profit, at the expense of communities that rely on nature for their food, shelter, start-up capital, and safety net in a warming world. So why should the World Bank care? Our concern is to build strong economies and healthy communities by revving the engine of inclusive green growth as we prepare countries and communities for the impacts of climate change. What does this have to do with elephant ivory you ask? Simply put, we cannot achieve our dream of a world without poverty without taking account of the rise in wildlife crime. Al Gore’s Climate Reality Project launches its “24 hours of Reality: Dirty Weather Report” today. It’s a global online multimedia event that seeks to demonstrate how climate change is manifesting itself around the world, showcasing countries, communities and individuals leading through innovative solutions. When you want to put money, ideas, innovation, and hard work together to increase food security, there’s nowhere better than the Global Agriculture and Food Security Program – GAFSP. Don’t just believe me. Listen to the Rwandan farmers whose now-terraced hillsides are getting higher yields, producing better nutrition, and improving their livelihoods. Similar stories can be told in Tajikistan, Sierra Leone, Bangladesh, and elsewhere. 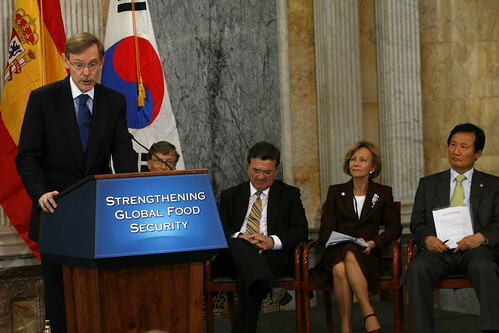 Japan and the Republic of Korea are among those convinced that GAFSP is a good investment in food security. Inspired by a challenge from the Unites States, Japan and South Korea just pledged an additional $60 million to GAFSP at a meeting in Tokyo held in conjunction with the World Bank and IMF Annual Meetings. The United States announced that it was prepared to contribute an additional $1 to GAFSP for every $2 contributed by other donors, up to a total of $475 million. Why is GAFSP so successful? Blogging Social Inclusion: Why Now? China is talking of a harmonious society, Brazil of social integration, India of social inclusion, and so on. The United Nations just released its first World Happiness Report, and more and more countries are asking their people how they feel! The social aspects of growth are causing more anxiety in the last few years than arguably ever before, as the Economist said, reporting on a 2010 Asian Development Bank meeting in Tashkent. Social inclusion is a pillar of the Bank’s social development strategy, and we have just embarked on a new policy research program through an upcoming flagship report. In the process, we hope to position social inclusion as a central feature of the World Bank’s work on equity and poverty. In a blog post by Molly Norris and Joshua Powell for the End Poverty in South Asia blog, they talk about Bangladesh as "ground zero" at the intersection of climate change and food security. "The country is widely recognized as one of the places most vulnerable to the effects of a changing climate, which strains food systems alongside rapidly growing and urbanizing populations. Yet, despite these dual challenges, the World Bank expects Bangladesh will meet its Millennium Development Goal (MDG) of halving the number of people living in extreme poverty by 2015," they write. A remarkable thing happened at the US Treasury in DC today; the United States, Canada, Spain, South Korea and the Bill and Melinda Gates Foundation agreed to pool resources, and as Bill Gates described it, “put small holder farmers, especially women, front and center” of a new multilateral agriculture and food security program. The Gates Foundation will contribute $30 million. The Global Agriculture and Food Security Program (GAFSP) will focus on increasing agricultural productivity and linking farmers to markets. A special feature of the program is the focus on country ownership that puts countries in the driver’s seat. The GAFSP was created in response to a call from G20 leaders last year for the World Bank to work with interested donor to set up a multi-donor trust fund to implement some of the $22 billion in pledges made by the G8 leaders at L’Aquila, Italy.